The Right Hon. Keith Mitchell, chairman of the Board of Governors of CDB and prime minister of Grenada, addresses delegates during the opening ceremony of the bank's annual meeting in Grenada on May 30. The Right Hon. Keith Mitchell, chairman of the Board of Governors of CDB and prime minister of Grenada, addresses delegates during the opening ceremony of the bank’s annual meeting in Grenada on May 30. ST. GEORGE’S, Grenada – President of the Caribbean Development Bank (CDB) Dr. W. Warren Smith urges regional leaders and development partners to work collaboratively and proactively to address the region’s vulnerabilities and to support resilience-building in the energy, agriculture and air transport sectors. In his opening statement to the bank’s annual meeting of its Board of Governors, the president shared perspectives on resilience, examined regional success stories and lessons learned, and pointed to opportunities for the Caribbean to triumph over recent setbacks—including the impacts of the 2017 Atlantic hurricane season. In his statement, Smith urged regional leaders to climate-proof their countries’ energy systems and invest in renewable energy and energy efficiency to build economic resilience. In addition, he highlighted opportunities that technological advances and price reductions in renewables present. “Taking advantage of these opportunities, as well as the wide-scale adoption of energy-efficiency measures, will assist in laying the basis for economic resilience through reductions in the public sector’s expenditure on energy; strengthening the fiscal balance; reducing borrowing requirements; and, as a consequence, reducing the pressure on countries’ foreign reserves,” Smith noted. The president acknowledged the critical contribution of the agriculture sector to economic activity in the Caribbean, noting that it accounts for more than 10 percent of output in Belize, Dominica and Suriname, and as much as 33 percent in Guyana. He said, however, the Caribbean’s agricultural output had fallen consistently since the early 1990s, partly due to climate change impacts such as floods and droughts. 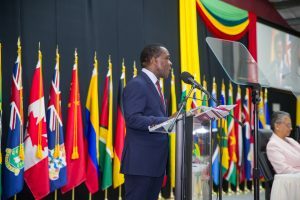 “If the Caribbean is to build resilience in agriculture, then substantial investments in changing agricultural practices and adapting to climate change are required,” said the president, who voiced support for increased financing to help farmers upgrade their irrigation and drainage systems to mitigate the risk and impact of droughts, flooding and soil erosion. The CDB, he pointed out, has been funding climate-smart and climate-proofing agricultural projects in countries such as Grenada and Jamaica. The projects also include training; and assistance in irrigation, renewable energy, storage for crops, marketing, extension services and other areas for farmers, who are among the most vulnerable groups in Caribbean societies and often reside in rural, poor communities. In a region of small-island economies heavily dependent on the agriculture, as well as tourism and financial services sectors, Smith said air connectivity is essential to their growth. The “vexed issue of regional air transportation,” he added, presents several major issues that stymie the movement of business and leisure travelers throughout the Caribbean. The president noted that high and regressive taxes and airport-related charges; operational inefficiencies within the principal air carrier; issues in the business environment within which it operates; and arrangements for funding the carrier are among factors constraining the ease and cost of travel in the region and the growth outlook for intra-Caribbean travel and tourism. “There is no sound justification for the regional airline industry remaining in this situation; indeed, its survivability is under constant threat,” said Smith. “Empirical research by CDB has demonstrated that we can significantly improve airline connectivity by lowering taxes, liberalising the regional market, and making changes to increase airport efficiency. The President pledged the CDB’s collaboration with shareholder governments of the region’s principal air carrier, as well as the governments of other Eastern Caribbean countries, which benefit from the inter-island services of the sub-regional air carrier. “The aim is to accelerate implementation of the reforms, which are needed to create a sustainable and resilient inter-island air transport system,” he noted. CDB’s annual meeting continues until May 31, with seminars and forums that update the bank’s governors on critical operational developments that could have implications for the bank’s day-to-day management. They will also consider proposed strategic approaches that could enhance CDB’s effectiveness and responsiveness to its borrowing member countries.